College of DuPage Applied Music Coordinator Michael Folker started his music career playing in his high school marching band. He has since perfected his playing to the point where he's now working alongside professional, world-renowned musicians and singers. Even his earliest musical experiences have shaped his approach to both teaching and his live presentations. The transition to teaching was natural, as Folker first started giving lessons while still in high school. He then studied music at Milliken University and earned his master's degree from DePaul University before beginning his career at COD. "I saw it as a great opportunity because the College didn't have a real percussion program," Folker said. "There's such a spectrum to the percussion world and every instrument is unique." The percussionist's teaching experience, however, isn't confined to the formal classroom. 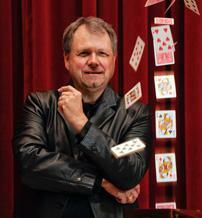 Folker has also studied magic and, along with the Elgin Symphony, developed an educational show melding magic and music. "I did some of these shows at schools and just before 2004, the director of the Elgin Symphony asked me to develop a show as a new approach to their music education program," he said. "It was a great challenge and I had a year to create the script." Fourteen drafts and numerous musical selections later, "The Magic of Music" debuted with eight performances in its first week. Since then, Folker has performed other incarnations, including "AbracaMusic" with his wife, Danielle, and "The Magic of Rhythm," which debuted through the McAninch Arts Center's SchoolStage program. "It seemed such a natural merging. Including an element of surprise in children's concerts is really important to create and keep their interest," he said. "It keeps it fresh. I always try to come up with something new to incorporate." Performing with touring artists also adds inspiration, Folker said. The musician has played alongside Doc Severson, Wynonna Judd, Celine Dion, Roger Daltry, Luciano Pavarotti and Victor Borge. "I've had so many opportunities to play with some very talented artists. What I do in the playing world, I bring into the teaching world," he said. Michael and Daniela Folker (a.k.a. 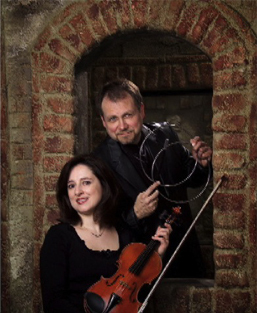 the Amazing Carringtons) are the creators of The Magic of Music, an educational magic show that demonstrates the similarities between music and magic. Michael is an active member of the musical scene in the Chicago area as a percussionist. He performs in a variety of groups, including the Elgin Symphony Orchestra, the Ravinia Festival Orchestra, the Chicago Opera Theater, the Joffrey Ballet Company, and the Chicago Sinfonietta. Some of the classical artists with whom he has performed include Luciano Pavarotti, Andrea Bocelli, Sir George Solti, Pierre Boulez, and Daniel Barenboim. Mr. Folker also performs extensively in Broadway shows, with big bands, and on commercial recordings. Violinist Daniela Folker was born in Bucharest, Romania where she began her musical studies at the age of four. Upon moving to the United States, she furthered her studies completing both a bachelor's and graduate degree in violin performance from Roosevelt University. She is currently Principal Second Violinist for the Elgin Symphony Orchestra and performs regularly with the Lyric Opera of Chicago, Chicago Opera Theater, Lake Forest Symphony and the Milwaukee Symphony Orchestra. Daniela has performed with such classical artists as Luciano Pavaratti and Andrea Bocelli. She has also performed with such artists as Celine Dion, The Moody Blues, Ray Charles, Linda Ronstadt, and has been featured on Late Night with David Letterman performing with Natalie Cole. 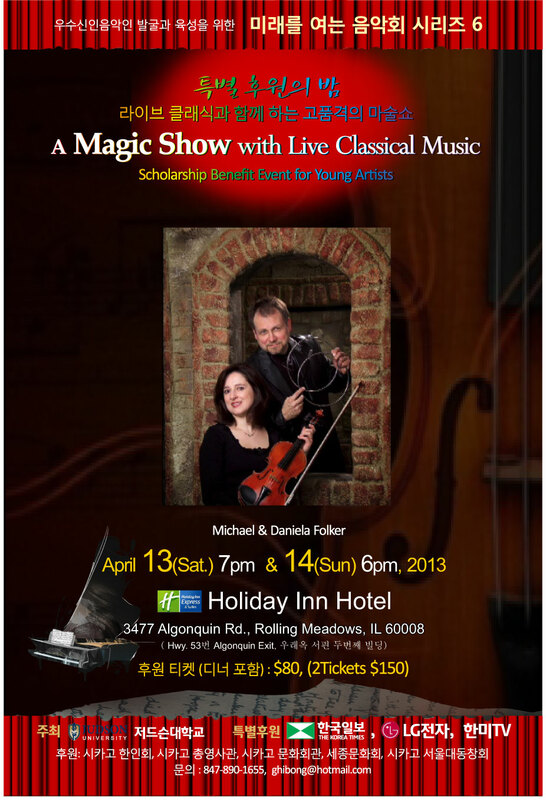 Daniela is on faculty as the violin instructor at the College of DuPage. "미래를 위한 음악회" 후원자 님들께 알려 드립니다. 우수 한인 음악도 발굴과 육성을 위한 "미래를 위한 음악회"의 제6회 장학기금 모금 행사가 오는 4월 13일 토요일 저녁 7시와 4월 14일 일요일 저녁 6시에 우래옥 바로 서쪽에 위치한 할러데이 인 호텔에서 열립니다. 이번 행사는 전통적인 개념의 음악회가 아닌 마술과 음악을 접목시킨 이색적인 공연입니다. 저녁 만찬이 있은 후에 한 시간 정도의 마술쇼가 클래식 음악 연주와 함께 진행됩니다. 초청된 마술사 Michael Folker 는 엘진, 밀워키, 라비니아 페스티벌 오케스트라 등 시카고 지역의 오케스트라에서 타악기 주자로 활발히 활동해 온 전문 음악가이자 마술사입니다. 약 10년 전부터 마술과 음악을 접목시킨 이색적인 음악 교육 프로그램 "Magic of Music"으로 시카고 지역의 오케스트라와 함께 여러 무대에서 공연해 왔고, 현재는 엘진 심포니 타악기 섹션 부수석이며 DuPage College 음악과의 타악기 프로그램 디렉터입니다. 이번 마술쇼가 진행되는 동안에 클래식 음악 연주를 맡아 줄 Mickael 의 부인 Daniella Folker 는 루마니아 출신의 미인 바이올리니스트입니다. 현재 엘진 심포니 오케스트라의 제2바이올린 수석으로 있으며, 남편과 함께 "Magic of Rhythm"이나 "Abraca Music" 등 소규모의 마술쇼 프로그램에서 함께 연주를 해 왔습니다. 마술과 음악 사이에 공존하는 신선하고 신비한 힘이 우리 모두를 동심의 세계로 이끌어 가는 드물게 즐거운 이벤트가 될 것입니다. 매년 열리는 미래를 여는 음악회를 통한 수익금 전액은 음악 전공자들을 위한 장학금으로 사용되고 있습니다. 구체적으로 말씀드리면, 미국에 와서 공부하고 싶지만 경제적 부담 때문에 감히 유학을 상상하지 못하던 재능있는 젊은 음악 전공자들을 한국의 유명 음대 교수님들의 추천을 통해 발굴해 낸 후에 이 학생들을 저드슨 대학교의 1년 코스 전문 연주자 과정에 전액 장학생으로 와서 공부할 수 있도록 해 주는 것입니다. 2008년 제1회 음악회를 통해 장학금의 혜택을 입은 학생은 서울음대 대학원을 졸업한 후 바로 이곳으로 오게 되었는데, 저드슨 대학에서 1년 과정을 마치고 한국에 귀국한 후 고향인 제천에서 오케스트라 지휘자로 활동하며 지방 소도시의 음악문화 활성을 위해 바쁘게 연주와 티칭을 하고 있다고 합니다. 작년에 귀국한 장학금 수혜자는 논산 출신의 피아니스트인데 경기 오페라단의 반주자로 활동하고 있고, 다른 수혜자들은 미국의 대학원으로 진학하였습니다. 이들 모두는 유학 생활 동안 짧지만 엄격한 음악 훈련을 거친 후 이를 발판 삼아 자신의 분야에서 지속적인 성장의 길을 가고 있습니다. 올해에 장학금의 혜택을 입고 오게 된 학생은 아주 특별한 경우입니다. 이 학생은 조선족으로서 중국 연변에서 태어나 연변대학교 피아노과를 최우수 학생으로 졸업하였고, 한국으로 건너가 석사 학위를 마친 후 지도 교수님의 추천을 받아 미국에 오게 되었습니다. 미국에 유학할 수 있으리라고는 꿈에도 상상하지 못했었는데 이 장학금 때문에 미국 유학이 현실이 된 것입니다. 한 분 한 분이 애써서 모금해 주신 후원금이 한국에서 자란 한인 음악도들 뿐만 아니라 중국에서 자란 한국인에게도 그 혜택을 뻗칠 수 있게 됨이 저로서는 너무도 감개무량합니다. 이번 매직 쇼의 티켓은 저녁 식사를 포함하여 1인 80불, 2인 150불입니다. 지금까지 후원해 주신 모든 후원님들께 진심으로 깊은 감사를 드립니다.